I love this bread with butter and a little honey alongside a hot cup of coffee. Try melting some brie cheese on a slice for a truly decadent treat. I also like to add almond flour to the final dough because I find it adds texture and results in a nice dense crumb, but if you can’t find it, it can be omitted or substituted with wheat germ. Diced apricots won’t take as long to absorb the liquor, but I prefer to leave the apricots whole so that you cut through them with each slice. I find it best to even leave the fruit soaking in the fridge for a few days just to make sure they are fully reconstituted. Measure out the ingredients for the poolish. The water should be room temperature, about 70 degrees (if you don’t have a thermometer, test by touch – the water should feel slightly cool, but not cold). In a large 6 quart bowl, dissolve the yeast in the water. Let it stand for about 5 minutes to let the yeast “wake up, ” and the mixture to foam slightly. Then incorporate the flour and stir continuously with a wooden spoon about 2-3 minutes until gluten** strands have developed. The dough will be sticky and difficult to stir. Scrape down the sides of the bowl, cover, and let the dough ferment at around 75-80 degrees F for at least 2 hours and no longer than 10 hours. I used to use either plastic wrap or a damp towel to cover the bowl, but recently have found that a silicone lid does the job perfectly. Once the poolish has doubled in size, usually around 2 or 3 hours, the final dough can be made. However, keep in mind, this first fermentation plays a primary role in developing the bread’s flavor, and the longer the poolish is allowed the ferment, the more complex the bread’s flavor will be. Measure out the ingredients for the final dough. Pour the water/honey mixture into the poolish. Break up the poolish with a wooden spoon, or using clean hands by squeezing through your fingers. Start by incorporating 1 cup (approx 5 oz.) of flour and the almond flour into the dough. Then add the salt, and gradually add enough of the remaining flour until the dough forms into a thick, sticky mass that starts to pull away from the sides of the bowl. Turn the dough out onto a floured board or work surface and knead for about 10 minutes, adding more flour as needed. 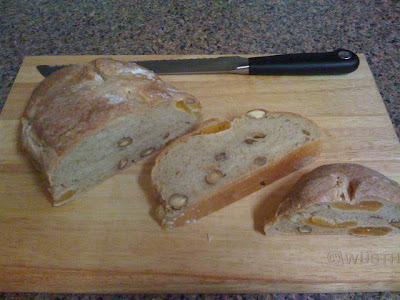 Gradually knead in the almonds, then the apricots, and knead for about 5-10 minutes more so that the fruit and nuts are well distributed. When dough has been kneaded enough, it is smooth and elastic and not very sticky. You can test the dough by either pulling a small mass from it or making an impression with your finger. Either one should spring back quickly. Shape the dough into a ball place into a lightly greased 6 qt. bowl. Turn the dough to make sure it is fully coated with oil. Cover the bowl and let the dough ferment until it is doubled in volume. If the dough has risen properly, it should be doubled in volume, and will not spring back if you poke it, as it did before. Deflate the dough and let it rest, covered for 30 minutes. Deflate the dough again and turn it onto a lightly floured board or work surface. Divide the dough into two or three equal pieces, and shape into rounds or roll into torpedo shaped loaves. If you prefer, you can line bowls, baskets, or molds (couches) with flour dusted towels and place the loaves top side down to proof. I usually just shape the loaves and put them on a heavy baking sheet to proof. Either way, lightly dust the loaves with flour, cover with a damp towel, and proof until they are about 1-1/2 times the size. If you are using molds or couches, transfer the loaves onto a baking sheet. Score the tops and place them in a preheated 450 degree oven. Spray the inside of the oven with some water and immediately shut the oven door to trap the steam. Repeat after 3 minutes, then bake the loaves until they begin to color, approximately 15-20 minutes. Reduce the oven temperature to 400 degrees then continue to bake for another 15-20 minutes until the loaves are golden brown and they sound hollow when tapped on the bottom. I like to bake a batch of bread about once a week, but of course fresh homemade bread, free of preservatives gets stale within 3 days. For a family of four, that’s probably not a problem since the bread isn’t likely to last that long. However for my household of two, I usually divide the batch into three loaves, cool them to room temperature and freeze two of them immediately, wrapped in foil. They take a couple hours to fully defrost, and taste almost as fresh as the day I baked them. This way we can enjoy home-baked bread all week. If I want to warm the bread, I’ll throw it in the oven still wrapped in foil at about 375-400 degrees until the center is just room temp (a cake tester or meat thermometer is useful for this). Unfortunately bread that has been rewarmed this way needs to consumed immediately and will not keep until the next day. So I usually just defrost the loaf, then toast each slice as the craving hits me. *20% bran flour is simply a mixture of 4 parts all purpose flour to 1 part whole wheat flour. Usually when I go the the grocery store, I will buy a 5 lb. bag of all purpose, and a 1 lb. bag of whole wheat. I reserve 1 lb. of all purpose for general baking and combine the rest of it with the whole wheat flour in a large container. I’m able to use all of it within two weeks, since it takes about 2-1/2 lbs. to bake one batch of bread. However, whole wheat flour contains more natural oils and will get rancid at room temperature. So if you don’t use it frequently, store it in an airtight container in the freezer and mix it into your all purpose flour as you need it. **Gluten is the protein found in flour. Working the dough by stirring and kneading develops the strands of gluten which gives yeast doughs elasticity and structure necessary to rise, and gives yeast bread’s their chewy texture. SOS: in the list of ingredients for the final dough you list 1/2 tsp dry yeast but it is not mentioned in the instructions for mixing and kneading the final dough. I’m ready to start mixing and don’t know whether the mistake is in the list of ingredients or the instructions. The 1/2 tsp. of yeast goes in with the honey and water, before you add the remaining flour. Sorry for the omission.